The White House says it's as simple as Trump sticking to, and delivering, what he promised — defying low expectations amid chaos and distractions. A veteran Democratic presidential adviser said that the Trump formula is taking a clear position and driving toward it — making sure everyone knows where he stands, and only focusing on one or two policy goals at a time. The adviser pointed to the cap on deductibility of state and local taxes — included in Trump's tax-reform plan — as an enviable achievement. "Presidents going back to Ronald Reagan have tried to do this," the Democrat said. "He had the determination and skill to get it done. Clinton didn't. Obama didn't." "You know what it’s called? Earned media," he said. "And I earned it." With midterms 35 days away, there’s some evidence that Trump's recent campaign to make this election about his favorite topic — him — plus the court fight has Rs more energized than at any point this year. Polling has swung sharply against Sen. Heidi Heitkamp (D-N.D.), with analysts pointing to Kavanaugh's popularity in the state as a factor. Trump's message and travel have greatly strengthened Republican Senate challengers in Missouri, Montana and West Virginia. Former Starbucks chairman and CEO Howard Schultz plans to travel the country beginning early next year, including stops in states that could help in a possible Democratic presidential run. 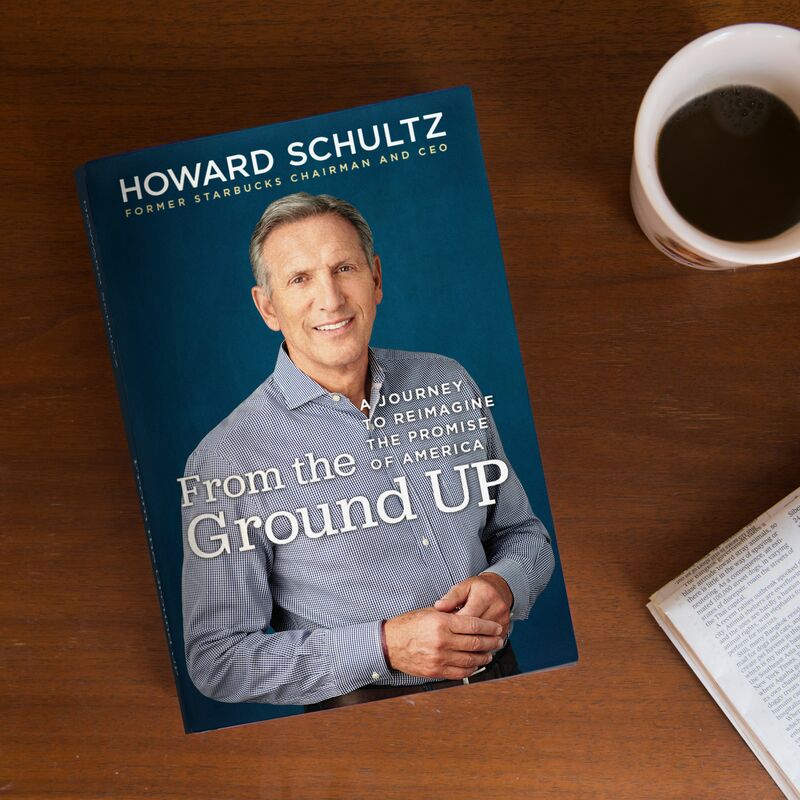 Schultz, 65, will hit the road to promote his book that'll come out Feb. 12, with the campaign-y title: "From the Ground Up: A Journey to Reimagine the Promise of America." The publisher, Random House Group, says the book "begins with the story of how a boyhood fraught with shame and fear motivated Schultz to become the first in his family to graduate from college and build the kind of company that his father, a working class laborer, never had a chance to work for." "A parallel narrative offers a behind-the-scenes look at Schultz’s journey to challenge preconceived notions of corporate responsibility. From health insurance, stock ownership, and free college tuition for part-time baristas to controversial campaigns about race and refugees, Starbucks became a lab for innovative ideas." Be smart: In a message that sounds much like a national platform, Schultz will emphasize opportunity for younger Americans. We hear that Schultz will argue that taking care of people and succeeding aren't mutually exclusive — that, in fact, one leads to the other. He'll talk about flouting the prevailing ethos on Wall Street of minimizing employee costs, and instead building a loyal, engaged workforce. This is no Medicare for All: Schultz will make a very centrist case, arguing that both business and government have roles in unlocking human potential. Looking ahead, Schultz is said to be considering both public service, and promoting catalytic philanthropy and social entrepreneurship at scale. The exception to those data points is the Brett Kavanaugh confirmation fight, which Republicans are using to target red-state Senate Democrats. Chaser ... Center for American Progress memo: "Not only is this an admission that Republicans have given up on yet another incumbent, but it is particularly an indictment of how ineffective the Republican anti-immigration attacks are proving to be." These satellite images show the Petobo neighborhood of Palu, Indonesia, on Aug. 17 — before an earthquake and tsunami devastated the area — and yesterday. "About 83% of U.S.-listed initial public offerings in 2018’s first three quarters involve companies that lost money in the 12 months leading up to their debut, according to data compiled by University of Florida finance professor Jay Ritter." "That is the highest proportion on record, according to Mr. Ritter, an IPO expert whose data goes back to 1980." Why it matters: "Some analysts ... see similarities with the dot-com bubble of nearly two decades ago that left many investors with enormous losses." "The prior high-water mark for money-losing companies going public was 2000, when 81% of stock-market debutantes were unprofitable, according to Mr. 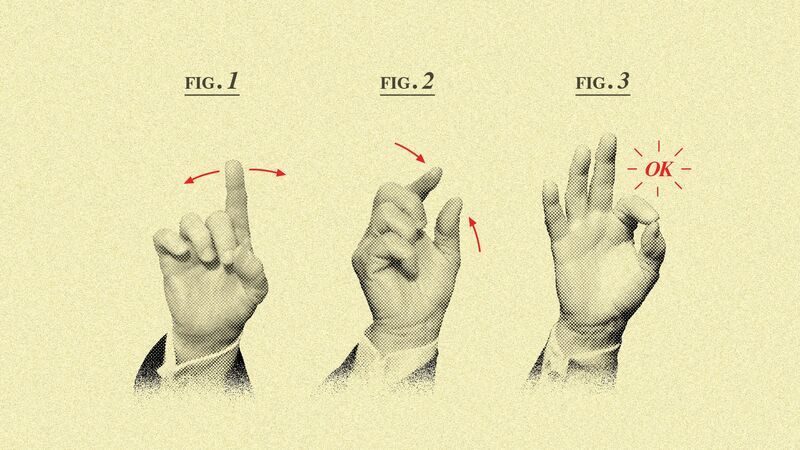 Ritter." 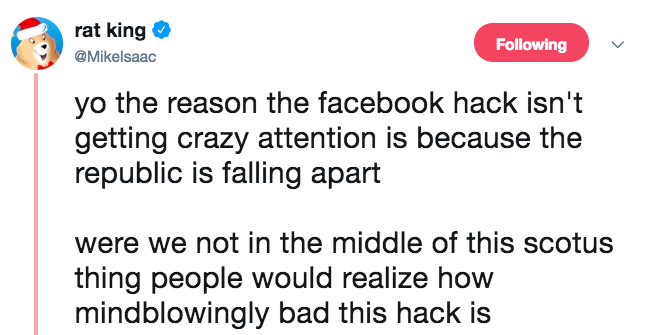 Facebook, third-party apps and regulators are scrambling to understand a breach that gave hackers access to 50 million accounts — a week after it was first discovered and four days after it was revealed, Axios' David McCabe reports. Remember: Past security failures on this scale have always ended up affecting much larger numbers of users than originally announced. Investigations are just beginning at online services that allow users to sign in with Facebook. Multiple Congressional committees want answers about the breach, with both the House and Senate commerce committees seeking staff briefings from Facebook. The European Union’s top data protection official tweeted: "This is really worrying news." "About 90,000 drivers in Los Angeles and Chicago agreed to participate ... late last year." "One commuter ... listened to a country and western channel often and stopped at a Tim Horton's restaurant. GM wondered whether that driver might be influenced to stop at a McDonald's instead if advertisers pitched, say, a new coffee drink there, on that same radio channel." It may be too late to stop Alzheimer's in people who already have some mental decline. But what if a treatment could target the very earliest brain changes while memory and thinking skills are still intact? "Clinics throughout the United States and some other countries are signing up participants — the only studies of this type enrolling healthy older people." 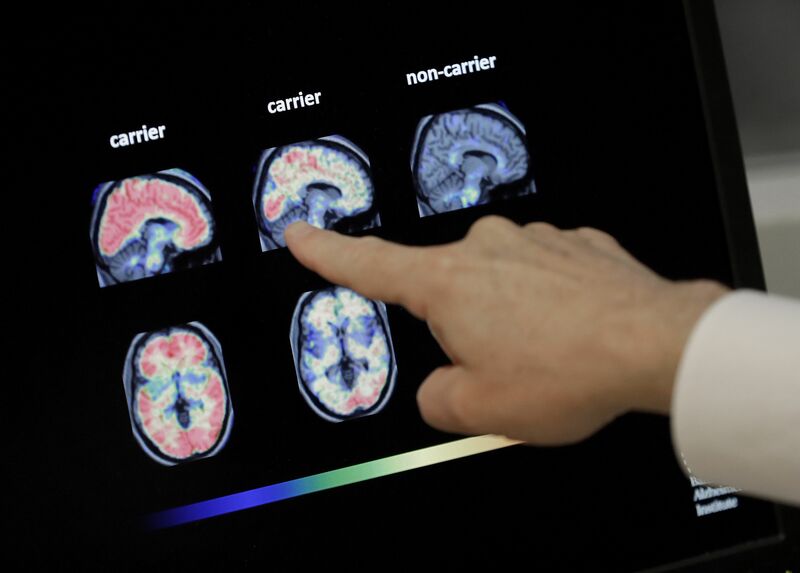 "The excitement in the Alzheimer's field right now is prevention," said Dr. Eric Reiman, executive director of the Banner Alzheimer's Institute in Phoenix, which is leading the work. Why it matters: "Science so far has failed to find a drug that can alter the progression of Alzheimer's, the most common form of dementia; 146 attempts have failed over the last decade." "It may be that [drugs] were tried too late, like lowering cholesterol after someone has suffered a heart attack whose damage can't be undone." "The goal [of the new research] is to try to block the earliest steps of plaque formation in healthy people who show no symptoms of dementia but are at higher risk for it because of age and a gene that makes it more likely." I'm not a drinker. I can honestly say I never had a beer in my life. OK. ... It's one of my only good traits. (Laughter.) ... Can you imagine if I had, what a mess I'd be? (Laughter.) ... I'd be the world's worst. Sarah Sanders' pie, from The Happy Cookbook. Copyright © 2018 by Steve Doocy and Kathy Doocy. Used by permission of HarperCollins Publishers. 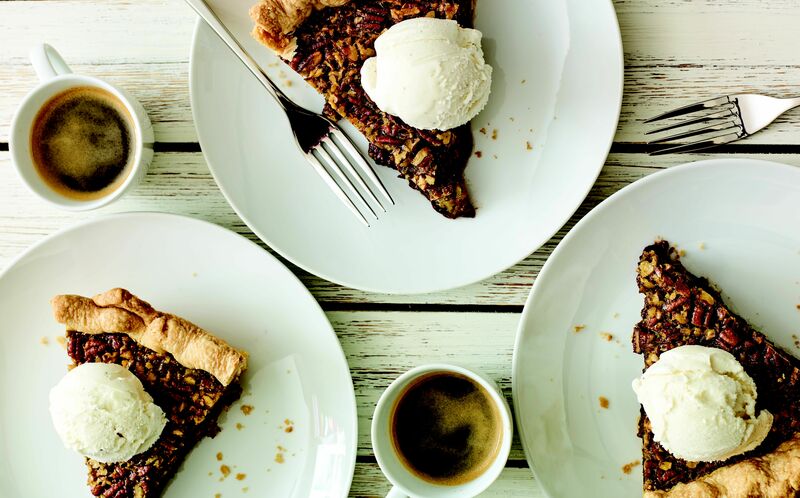 Out today ... Sarah Sanders' chocolate pecan pie, which became Twitter-famous last Thanksgiving, is featured in "The Happy Cookbook," by "Fox & Friends" host Steve Doocy and his wife, Kathy. She uses good bourbon and a store-bought pie crust, because sometimes life is too short to make crust from scratch. Her final touch? She uses a hammer — not kidding, a real hammer — to crush the pecans in a zip-top bag. "Less mess than a food processor, and a great stress reliever!" The book includes recipes from Sean Hannity, Dr. Oz, Peter Doocy, Martha MacCallum, Kid Rock, Stuart Varney and more. Fun fact from the publisher: At age 9, Doocy won a blue ribbon at the Kansas State Fair for baking chocolate chip cookies (he used the recipe on the bag).